Not only does spring mean warmer weather, but it brings every student’s first break of the year – SPRING BREAK! Lasting March 9th-22nd, we’re overjoyed to share the best of Arlington events with you. Six Flags Over Texas – There’s still time! Open 16 days for Spring Break this year, catch major g-force on Titan and twists and turns on the New Texas Giant. Take flight on Batman: The Ride or the Guinness Book of World Record-holding The Texas SkyScreamer, the tallest swing ride on the planet. 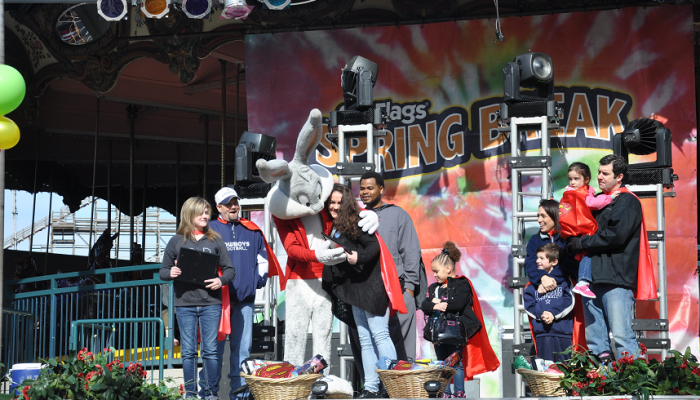 For the little ones, Bugs Bunny Boomtown has a plethora of fun kid-sized rides the kiddies with love! If you enjoy Six Flags from the bench, don’t miss out on the delicious food, which includes corn dogs, funnel cakes, barbecue and other popular American fare. Browse shops, including the M&M&apos;S® gift shop, LOONEY TUNES Mall and more. Book your exclusive packages that include a hotel night and tickets. Become one with nature this Spring Break, or at least try at North Arlington’s River Legacy Living Science Center. They’re offering $2 science and nature activities including family-friendly hikes, reptile encounters, bug detective activities, “awesome opossums” and art projects fit for all ages. There’s even a free nature walk at 2 pm on Saturday, March 14. RSVP by calling 817-860-6752. Needing a little luck of the Irish for Spring Break? Arlington’s many partners have plenty of green beer, good food and hospitality to celebrate. Restaurant partners like Humperdink’s will be serving special Irish food and beer, while local favorite Hooligans Pub will be having a full-on event that includes specials, green beer and more! South Arlington treat The Melting Pot will have a special four-course Irish menu as well as a “rainbow” of drink specials. Need more? Check out our list of St. Patrick&apos;s Day events for times and dates. Set against both AT&T Stadium and Globe Life Park on both sides, this 4th annual art event brings local and regional artists together to sell and exhibit art. Tree-lined paths and the Caelum Moor exhibit create the landscape for Art on the Greene as local, regional and national artists, delicious food vendors and live music streams through the festival. If you&apos;re looking for a family friendly event this spring break, visit Art on the Greene! The catch? We had to spring forward and lose an hour of sleep. Good news is, we have more sunlight to enjoy during Spring Break!